Summertime is great for free festivals! There are music festivals, art fairs, food festivals, even kite festivals! Once the weather gets warm there are all kinds of free summer events you can enjoy outdoors. 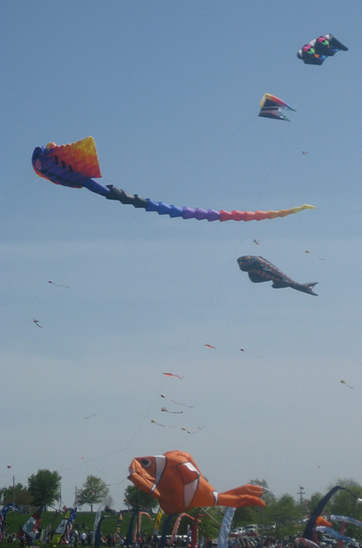 The picture you see here is from a local kite festival that was a good time and a great summer event for kids. Our son and daughter enjoyed hours of fun watching the enormous kites fly around the sky and the festival was free of charge! Many times companies or organizations will sponsor summer festivals and other events because they know a lot of people will be there and they want to get the word out about thier product or service. Since the sponsors provide the funding for the event, it’s free of charge to you! As I mentioned above there are all kinds of free festivals and fairs in the summer time that you can visit with your family. We packed a lunch and brought a blanket so we didn’t even have to pay for food. Instead we enjoyed a picnic while we sat on our blanket and marveled at the huge variety of colorful and acrobatic kites sweeping through the sky. The only cost of the outing was the gas we paid to travel there, not bad for a few hours of entertainment. The best place to find a list of summer festivals varies depending on the city you live in but a good place to start is a simple web search. For example, if you live in Chicago you could search for “summer festivals Chicago”. Another good place to look is the website of your local newspaper, check out the events section. Enjoy the nice weather and the free festivals!